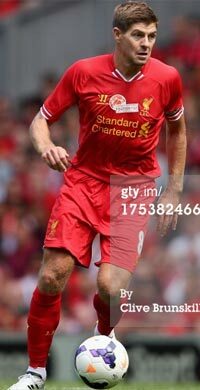 This article before Testimonial Steven Gerrard a match. 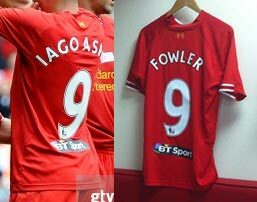 Which will be played on August, 3rd, 2013, on Anfield, against Olympiacos (Greece). 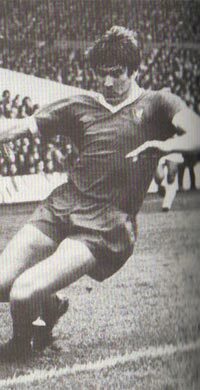 Testimonial matches, it at times farewell (honour) matches of players leaving or soon to leave club, there Is, as to matches Testimonial Bill Shankly (04.29.1975) or Testimonial Ronnie Moran (0516.2000) which have been played after the termination of staff's career in Liverpool, shall remind, Ronnie Moran was the player of Liverpool with 1952 for 1965. on May, 16th one more match on Anfield, a match Legends Liverpool and Celtic (Glasgow) has been played. 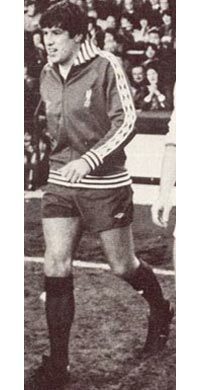 In match Kenny Dalglish played the first half time for Celtic, and in the second half for Liverpool, interesting one, Kenny Dalglish in the second half time has forgotten to change clothes of socks (look below). 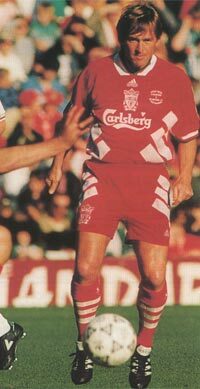 And the second, veterans played one shirts, and a basis of Liverpool in others, I about design of shirts, Besides on shirts of Legends was not usual advertising of club Carlsberg, and was TRAVEL OPTIONS. 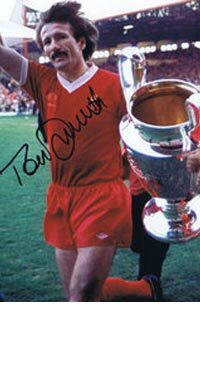 TRAVEL OPTIONS as I understand, the sponsor of a team Liverpool Legends in this match. 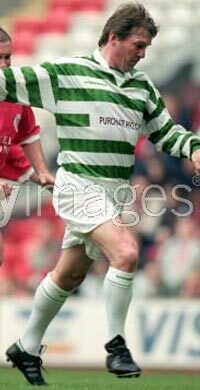 I shall notice as, team Celtic Legends, played in shirts not the basic team, and the sponsor was another. 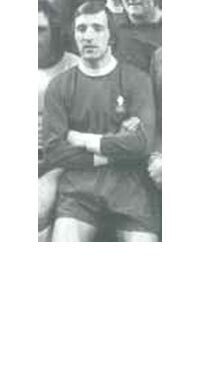 History Testimonial of matches for Liverpool begins with 3/23/1893 of year, in Testimonial David Kirkwood a match against team Bootle Boys Brigade. 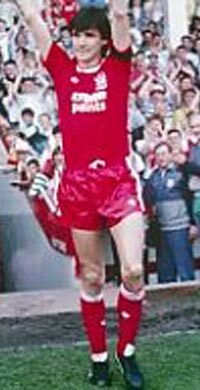 As well as in the subsequent Testimonial matches, usual shirts for that moment have been used. 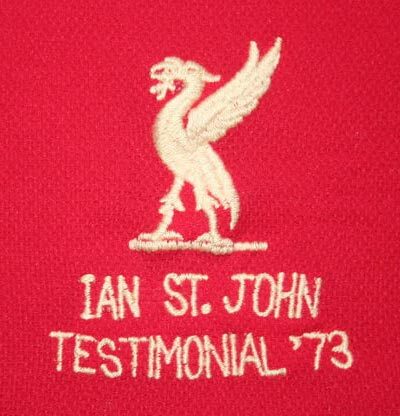 The first shirt, at least, known to me with the special embroidery, made to concrete Testimonial to a match, was for Testimonial Ian St John a match (04.30.1973), against Chelsea, the match has been played on Anfield. 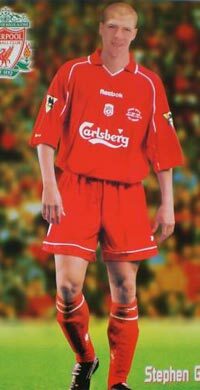 At that time, 70th years, Liverpool was equipped firm Umbro, however the shirt with a special embroidery has been made by firm Barralan. 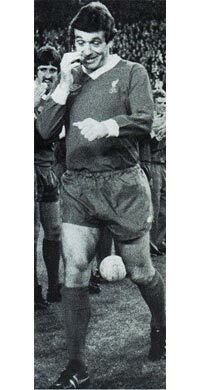 In the further, after Testimonial Ian St John a match, shirts with special embroideries for Testimonial matches were not always produced, I shall write to you more, Liverpool, not always played shirts with special embroideries in Charity Shield (1971, 1974, 1979, 1980, 1982, 1983, 1984, 1986, 1988, 1989, 1990, 1992, 1994) or in League Cup Final (1981, 1982, 1983, 1984). 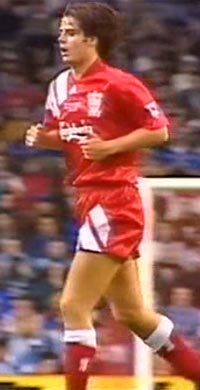 In matches when contenders of Liverpool played it shirts with special embroideries (not always). 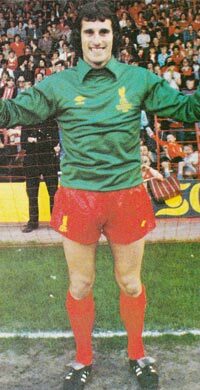 The known special shirt first, at least, to me made to a concrete match by firm Umbro, was for Testimonial Ray Clemence a match (05.14.1980), against Anderlecht (Belgium), the match has been played at Anfield. The interesting fact. 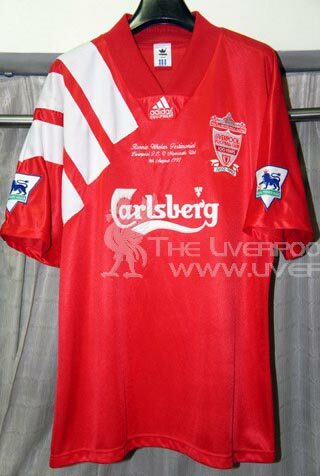 Sammy Lee Testimonial match shirt made in 1986 year, but used in 1988 year. 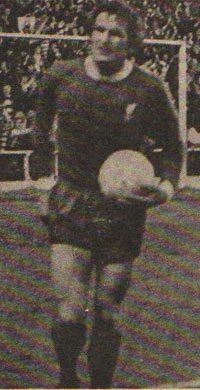 Originally the match was planned to play in 24th March 1987 versus Rangers (Glasgow), but a game that was never played on police advice. 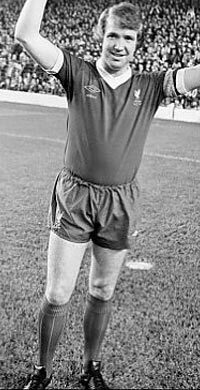 Sammy Lee Testimonial match was payed versus Osasuna (Spain), 2-0, 01.03.1988, at El Sadar, Pamplona, Spain. There is one more feature of shirts for Testimonial matches, shirts are used not only an operating season, but also previous, and as future season. Here some examples. 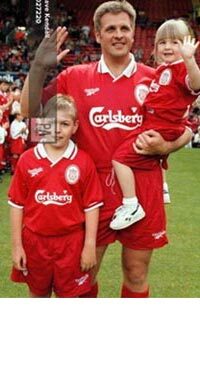 In a season 1993-94, for match Testimonial Ronnie Whelan (08.09.1993), it has been used the home shirt since a season 1992-93, that is since the last season (at the left below) the Return example, in a season 1999-2000, for match Testimonial Steve Staunton and Tony Cascarino (05.21.2000), has been used a home shirt since a season 2000-01, that is since the future season (on the right below). 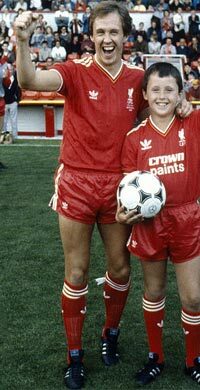 At the left, a player shirt from match Testimonial Ronnie Whelan № 4 (08.09.1993). 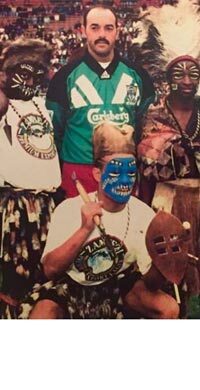 On the right, a player shirt from match Testimonial Steve Staunton and Tony Cascarino № 25 (05.21.2000). 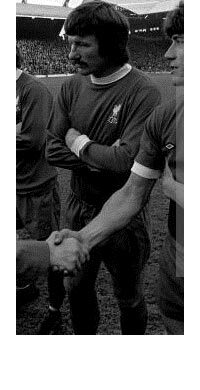 (image with site The Liverpool Shirts Museum www.liverpoolkits.com). 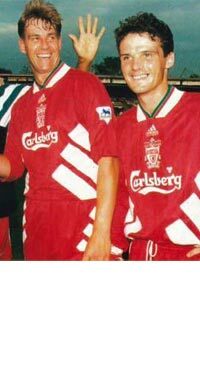 In general it is surprising, but after match Testimonial Steve Staunton and Tony Cascarino (5/21/2000), following Testimonial a match, has been played only 9/4/2010, and it was Testimonial Jamie Carragher. 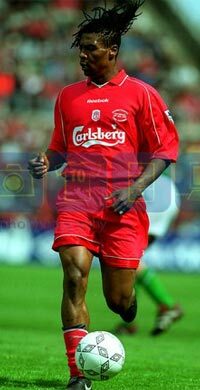 For ten years it has not been lead not one match, and left club, stars of Liverpool, such as Robbie Fowler, Jamie Redknapp, Michael Owen, Sami Hyypia and others. 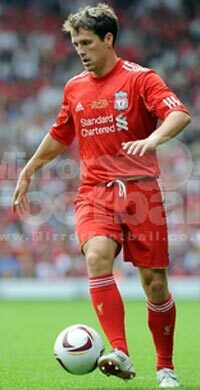 * As it is not strange, in Testimonial Steven Gerrard (03.08.2013) a match not used a special embroidery, but on a T-short there was print STEVEN GERRARD FOUNDATION. 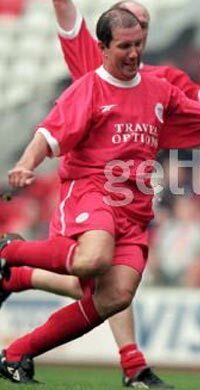 Besides, at number of the player on a back there was a trade mark of the new British telecommunication company of sports programs in the Great Britain and Ireland B T Sport (a trade mark of the company and on a shirt look below). 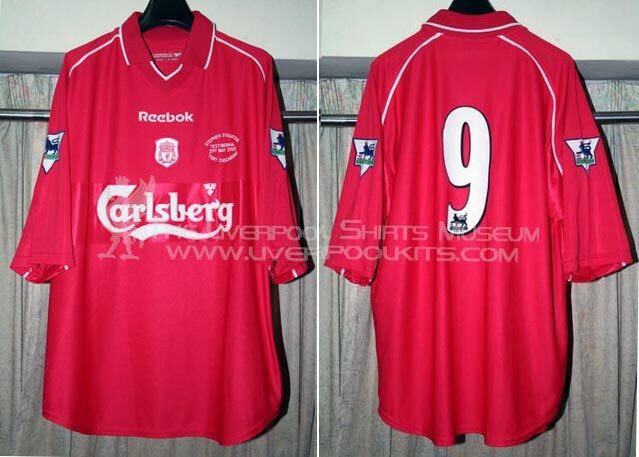 To this match the club has let out a shirt of the limited quantity. Curiously, but in this match two players played at number 9. 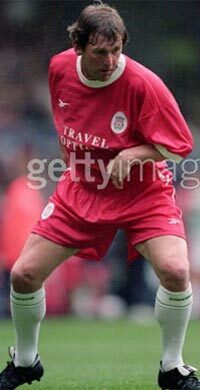 In the first half at number played Iago Aspas, and in the second under the nine played Robbie Fowler as you understand Aspas, all second half on a bench spare already sat. Interesting fact. 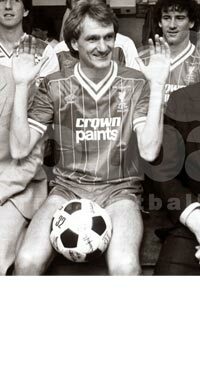 Three photos with different Testimonial matches, all was played at Anfield. 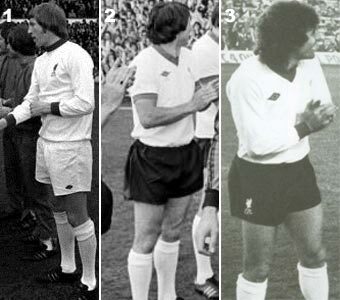 How you to see on this players dressing away kits Liverpool F C. Teams: England XI (11.04.1972, Testimonial Roger Hunt); Don Revie Select XI (29.04.1975, 1st image, Testimonial Bill Shankly); Bobby Charlton XI (27.05.1977, 2nd image, Testimonial Tommy Smith); Swansea City (11.10.1978, 3rd image, Testimonial Chris Lawler) - on all players this teams was dressing away kits Liverpool F C.
Below, list Testimonial of matches in which it was used shirts with special embroideries for these matches. 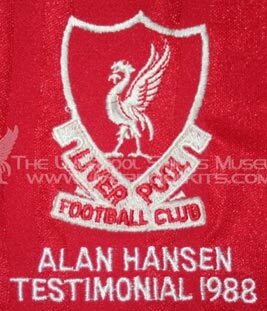 Full list Testimonial of matches of Liverpool F C, here. Write to me contact us. 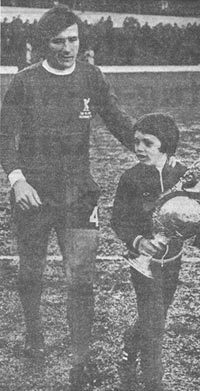 Article in the further will be added.